It's Spank and Ginger in the morning, The weather in Boston, Massachusetts is 34 degrees with a mixture of snow and rain. Make sure to wear your Red Sox because you're gonna freeze your baseballs off! Traffic on the 405 is bumper to bumper, so today would be a good day to practice using your "R's" when you speak. Do we care about this Spank? 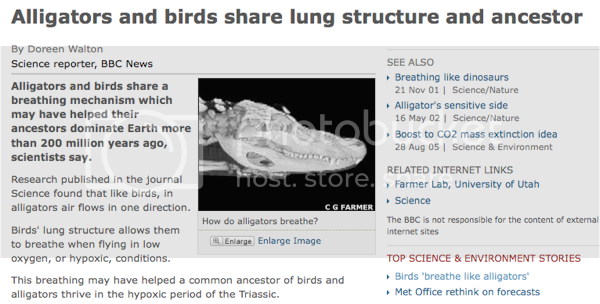 I will care about this when alligators can fly. I actually really like gators. You know, the ones who DON'T play football. Cause those I don't care for at all. Unless they're in Miami and then we're cool. She knows. She always knows. She's got some sort of anti-Gator radar. Like Gatdar. (which is kind of like Gaydar but not really). Moving on... Spank, did you see this? I did not, Ginger *sets my DVR singing* "It's a miracle, a true blue miracle..."
You know, Spank... my love for you is so deep, I'm willing to overlook things like your love for Mr. Barry. Barry Manilow is timeless... like Rolex and Dennis MF Quaid. *rolls eyes* I love you Spank. *sings* "Love is in the air, everywhere I look around love is in the air, every sight and every sound"
Ok, can we move on? I'm trying really hard to tolerate the Barry-lovefest going on. How about a WTF moment, cause I think I'm having one right now. What's the difference? She was plastic before her surgery. I wonder if I'm going to get hate mail over the "she should keep getting plastic surgery" comment. Sure babe, and I'll blip Wham! more. We really know how to show our love, don't we? Why am I first today? I hate being first almost as much as I hate slopp....nevermind. Ladies I love you both equally; and I really cant say that I love Barry Manilow and more or less than Wham! I'll never be a "Fan-ilow" like Ms. Spank; but he's relatively timeless and really altogether Harmless. Did I really just use a term I heard on Will & Grace? he he he....Fan-ilow. Debra Messing. Pretty Girl; #ravishingRedhead; iNatural Mosquito bites. I guess I could ramble on for a while; but really; I'm uninspired. Heidi-the-Prat?? I'm really no supporter of plastic surgery; but if it makes you happy; hey; it's your body. At least the changes are real; not like the Fass. Awww - I love it when you guys fight about football. It warms my heart. Also? I love it when you sing your love of Barry & Wham. It makes me throw up in my mouth, but I love it. Heidi is retarded. She's never going to get it... we really don't care WHAT you look like, chick!!! I keep getting distracted by the naked showering man! 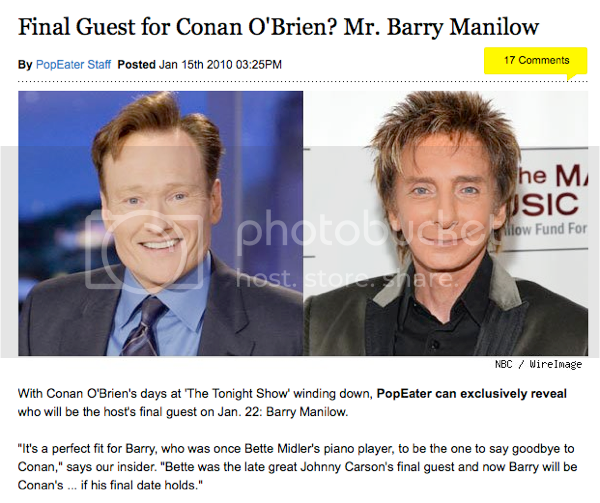 My mom died when she saw that Barry Manilow is going to be the last guest. She is a bigger Fanilow then Spank. I almost gaurentee it. BTW, Heidi? Uhm.. I'm sorry but she's not getting any prettier with plastic surgery. I dislike NBC now. They're getting rid of one of the legendary show comedians in the history of the making. Heidi Montag is a funny face woman. I think Spencer told her to look like Paris Hilton for a day. Maybe we can just relegate Heidi Montag into the same category as Hoff Soap and werewolf babies. Hmmm... Can you please discuss Kate Gosslin's new hairstyle and how much she now looks like Heidi? It's rather scary..